New restrictions, long lines, and a server breakdown are making it harder to vote in critical primaries. Wisconsin has historically been an easy state in which to vote. That has contributed to high turnouts—often the highest in the nation—and a vibrant political culture. Since his election in 2010, however, Wisconsin Governor Scott Walker has worked with his legislative allies to make it harder to vote: by enacting a narrowly defined and restrictive voter-ID law and by moving to limit the hours for early voting. On Friday, the final day for early voting in the closely contested Democratic and Republican presidential primaries (both of which could see front-runners upset by challengers), the voting process was complicated by a server outage that caused serious delays at early voting locations. “At approximately 8:45 a.m. this morning numerous state agency applications that are hosted by the Department of Administration (DOA) Division of Enterprise Technology failed due to unknown reasons. This affected all GAB applications that are hosted on the DOA enterprise including WisVote, MyVote Wisconsin, BadgerVoters, Canvass Reporting System and the WI Data Collection System. WisVote is the state’s electronic voter registration and election management system, and MyVote Wisconsin is the website which voters can use to find information regarding their ballots, polling places, and clerk contact information,” announced the state Government Accountability Board, which oversees elections. The applications were “back online and functional” by around 11:30 am. That level of disruption is a serious issue on a day when there were already long lines at clerks’ offices, as voters sought to cast absentee ballots not just in the presidential primaries but in a hotly contested state Supreme Court election and numerous local contests. 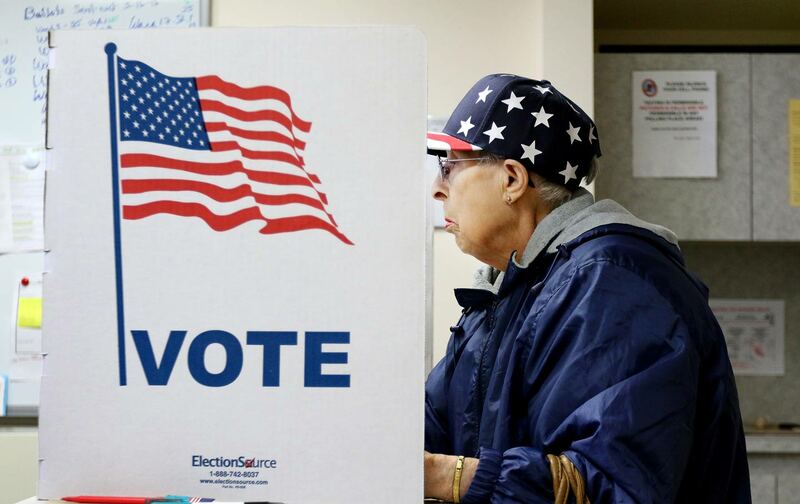 Concerns have been raised raised in Wisconsin and nationally by Ari Berman and other observers of voting-rights issues about the impact of state’s new voter-ID law. And now those concerns are heightened. “On the final day of early voting and with just two business days before Election day to get the ID now required to vote a technology failure at Governor Walker’s Department of Administration is forcing voters to wait in long lines or, if they are not able to stay in line, lose their opportunity to vote today,” said Scot Ross, the executive director of the progressive group One Wisconsin Now. The breakdown led to calls for an extension of early-voting hours statewide, and for extension of hours for obtaining voter IDs. In Madison, the state capital, officials announced that people on line when early voting hours were supposed to end—at 7 pm—would be allowed to cast ballots. But state officials did not immediately announce plans for extending early voting into the weekend or Monday. Whatever action is required should be taken not just to extend early voting but to insure that voters seeking voter IDs from Department of Motor Vehicles facilities are accommodated. That would be the right response in any election year, but it is especially necessary in a year when the state is implementing the restrictions enacted by Walker and his allies, and when Wisconsin voters will be required to produce newly required IDs in order to cast ballots on Tuesday.